« Entertaining Is Serious Business! Anyone who tells you that 2009 was a walk in the park has been dipping into the egg nog. With the possible exception of my two best friends on earth… my dogs! Now look, I love my family. I am truly blessed. But heck, they are only human. They have their ups and downs. They have needs that are complicated, time consuming, and expensive! My canine companions, however, are undemanding, loyal, easy to please. A fresh bowl of kibble, a bone, a belly rub, and life is beautiful! Which is probably why I derive such satisfaction from spoiling them rotten. When Pacific Merchants launched the Mason Cash line of stoneware stateside this summer, the first thing I did was order a wide variety of their legendary pet bowls. 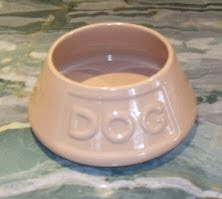 Sold in dozens of countries around the world for over forty years, these handsome dog and cat bowls are considered the “Rolls Royce” of pet products. Beautifully designed, crafted and meant to last a lifetime, they are also an excellent value! Made of heavy stoneware, Mason Cash pet bowls won’t get tipped or pushed around during meal time, and keep food and water cool longer than other bowls. The thick lip at the top of bowls is chip and bite resistant, and we even carry angled bowls that prevent spillage, and keep long, droopy ears dry and out of the chow! To make a sweet deal sweeter, a percentage of all proceeds of Mason Cash pet accessories also goes to the Royal Society for the Prevention of Cruelty to Animals! So, when you want to spoil your very best friend (dog, cat, rabbit, hamster), purchase a set of Mason Cash pet bowls. And don’t forget that walk in the park. This entry was posted on Wednesday, December 16th, 2009 at 2:34 pm and is filed under Pet Goods. You can follow any responses to this entry through the RSS 2.0 feed. Both comments and pings are currently closed.